Living beyond the walls of your home outdoors seamlessly to capture the serenity of the morning sun and after evening dinner gatherings were on the menu for this great family. The idea at hand brought forth by outdoor living fabulously designer Michael Gotowala founder of THE OUTDOOR KITCHEN DESIGN STORE by PREFERRED PROPERTIES were graciously accepted and the work began to not only enlarge the deck space but to capture value centers for Outdoor culinary, evening bar and Alfresco and the convenience of a nearby splash in the hot tub surrounded by granite and even a remote Fire feature above the hot tub. 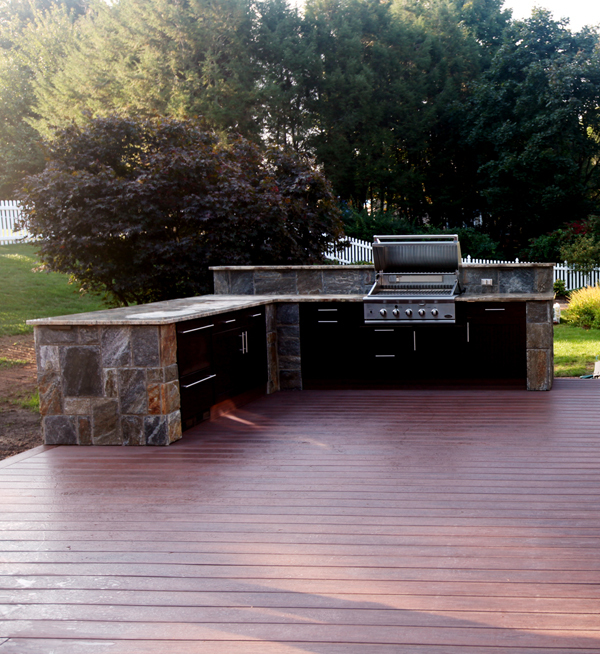 All these features part of the recipe for Living Outdoors fabulously. If you look close enough you can see the masonry details in which Preferred Properties is known for. 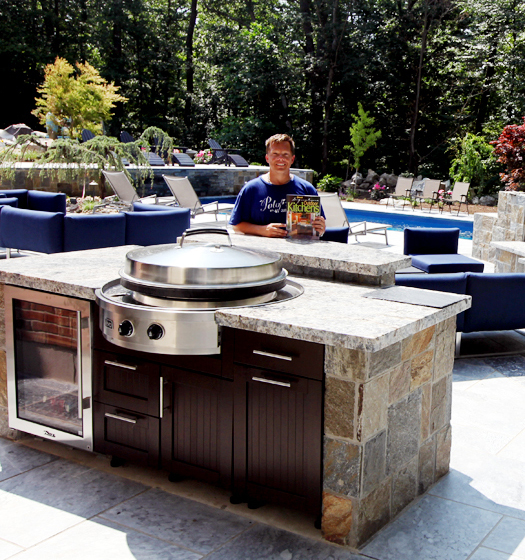 The elegance of Stone surrounding Brown Jordan's cabinetry in Java color shows the insightfulness of masterful outdoor Kitchen builder Michael Gotowala founder of THE OUTDOOR KITCHEN DESIGN STORE by PREFERRED PROPERTIES. 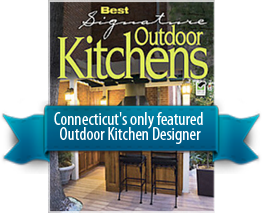 The sprawling outdoor grill island has plenty of work or play space for that matter highlighting DCS grill, plenty of storage, two drawer refrigerator and a trash pull all capped off with large swirling granite counters. A nice touch here is the top shelf designed for sight lines from entering the back yard, wind blockage for grilling, receptacles, and even night lighting underneath to illuminate at night.